Dr. Deepa Massey completed her M.B.B.S. in 1987 from the Christian Medical College (CMC), Ludhiana and thereafter worked in Mission Hospital in Kanpur, India for a period of 2 years. She returned back to CMC, Ludhiana to complete her M.D. in Biochemistry in 1995. She was then selected on the faculty of the Department of Biochemistry as a Lecturer in Biochemistry where she worked from January 1996 to May 1998. She has been with NMC Healthcare since March 2001. 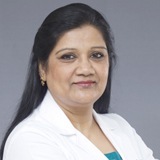 Dr. Deepa Massey is a member of Association of Clinical Biochemists of India. She has an active interest in laboratory quality and safety and has attended several conferences and workshops on the subject and is a trained IS0 15189 auditor. Dr. Deepa Massey is the head of department of NMC, Deira Laboratory which is ISO 15189:2007 Certified. Dr. Deepa Massey is well versed in English, Hindi, Punjabi, and Urdu.